Follow @mcphoo Tweet Creatine and Beta Alanine are increasingly discussed and used supplements. How might either fit into the kind of training program that works both endurance and power, like say kettlebell training? The following is an overview of some work that's looked at creatine, beta-alanine, and the two together for aerobic power. Creatine (Cr), an amino acid, is perhaps the most researched supplement on the planet. When it first came out the hope was that it would improve endurance. Apparently, It didn't, and looking back, one might say understandably so, since creatine mainly benefits the phosphocreatine (PCr) energy system - that system used mainly by sprints or sudden explosive moves that makes a blast of ATP (our energy fuel) available for work, fast. It takes about 10 - 30 seconds to use up the ATP from PCr and about 6 minutes to resynthesize it at rest. The idea of creatine supplementation is that by getting more Cr into the muscle, more PCr will be available and thus more fast ATP is available for a sustained power blast (see for instance Kreider 98 and Volek, Kraemer and crew 97). When tested to see if it would help endurance athletes stay out longer before fatiguing, it just didn't. Consquently, folks who sprint or folks who do power training in particular, where the focus is on low rep sets but high volume, generally like creatine. It's one of two supplements iron game master Clarence Bass uses. The other being Whey. So it's pretty durn normal and pretty durn popular. For resistance training. Endurance Redux. Intriguingly, in what seems like a wee corner of the creatine research world, some researchers have kept studying the aerobi/endurance space. In certain but quite common contexts of effort, creatine may actually help. Here's a quick review. A good deal of research on endurance looks at time to exhaustion when pumping out maximal load. It's these kinds of tests where creatine didn't make a difference. Creatine or not, people quit pretty much at the same time to exhaustion. 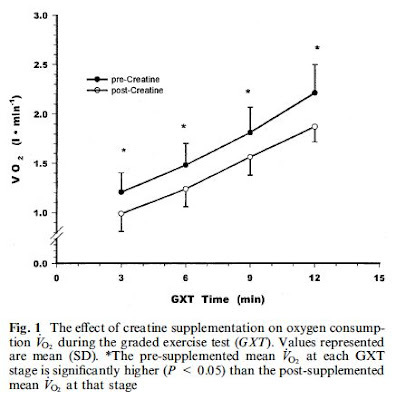 In 2000, researchers set up a test to see if there were different levels of effort - submaximal loads (like VO2Max training) - creatine may make a difference to anything like maximal oxygen level for load and time to exhaustion. In summary, creatine loading alters the initial mtabolic responses seen during a short-stage GXT. These alteration are most significant at the early stages of the GXT and are mnifested by a lower sub-maimal Vo2 and heart rate at the end of each GXT stage. The creatine group also lasted about 70s longer, and had a significant improvement in T(vent) or Ventilatory Threshold (VT). AKA Lactate Threshold (a concept familiar to folks doing Viking Warrior Conditioning (VWC) and thinking VO2Max thoughts). VO2max training, remember, isn't sprint training or a maximal effort. It's submaximal, designed to push the edge of the aerobic envelop - to get greater oxidative capacity before flipping over to the anaerobic/glycolytic energy system. Cr sounds pretty good. Heart & Power The authors hypothesize that Cr may impact VT due to the presence of greater PCr in the muscle This means the muscles can use that PCr as an energy source a wee bit longer, and that it MAY also be using H+ better (lactate buffering, keeping the Ph balance steady, so delaying fatiuge). Maybe. Now that sounds like Cr. is good for endurance after all? In 2005, researchers looked at creatine on aerobic power as well as - way cool - what it does to the heart. Their concern was that if creatine brings water into the muscle (that's a not bad thing), what if it did this to the heart? Turns out, from their study that at least 4 weeks of sup'ing with Cr doesn't do anything negative. Groovy. They also found great lean mass improvements without fat mass improvements, though they didn't know what the mechanism for this was. But what about endurance? Well, as of days of old, nothing again in terms of maximal effort in time to exhaustion. Indeed, they found, unlike the 2000 study, that there was no real significant difference in time to exhaustion between Cr & placebo groups, but once again, submaximal loads showed lower heart rates/more work. The authors noted additionally beyond the 2000 study, that there was a "significant 3.7% decrease in HRmax following Cr supplementation." They couldn't entirely figure out what creatine was doing that resulted in the lower HRMax, since they saw no changes in the heart with the creatine. They speculate the effect may be due to plasma changes or Doppler flow changes. Creatine and Beta-Alanine Combo for Endurance? More recently (2006) in the journal Amino Acids, researchers looked at these same measures but investigated creatine & beta-alanine individually and Cr and BA in combination. Like Reece's peanut butter cups, ya got two great tastes that go great together, at least this seems to be indicative. The most noteworthy finding of this study was the significant increase in five of eight indices of cardiorespiratory endurance with CrBA supplementation. Individually, supplementation with Cr showed improvements in power output at VT and TTE, while b-Ala only demonstrated an improvement in power output at LT. A significant improvement in TTE was seen in the placebo group, but this was accompanied by decreases in power output and percent _V VO2peak at LT. The improvement in TTE seen in the placebo group appears to have been driven by relatively large increases in four of the subjects. These individuals demonstrated increases in TTE of 40, 45, 62, and 63 sec compared with a non-significant decrease of 15.4+/- 7.2 sec in the remainder of the group. However, any conclusions based on these findings must be tempered by the fact that there were no significant between-group effects. Regardless, the present data at least suggest that supplementation with CrBA may enhance the potential for submaximal endurance performance as measured by the lactate and ventilatory thresholds....these data at least suggest that supplementation with CrBA especially may delay the onset of the VT and LT during incremental cycle exercise in men. Future studies should examine muscle carnosine and=or PCr levels along with blood lactate concentration during submaximal fatiguing exercise with and without b-Ala and=or Cr supplementation. What about HIIT, Cr and Endurance? Now the interesting bit is where the supplement consideration falls apart again, and researchers' interests turn to HIIT and creatine in 2009. The idea would be that surely here, we'd get to an endurance breakthrough with creatine. But no. once again, doing the time to exhausion test, total work done is the same in both groups. What about Beta-Alanine and HIIT? Same year, same journal, and pretty much the same HIIT study uses beta-alanine instead of creatine. Results: Significant improvements in VO2peak, VO2TTE, and TWD after three weeks of training were displayed (p <>2peak, VO2TTE, TWD and lean body mass were only significant for the BA group after the second three weeks of training. A key point? while BA did actually improve TWD - total work done - as well as improving that illusive Time to Exhaustion, it took over three weeks of supplementation of 6g a day. High-intensity exercise results in diminished stores of adenosine tri-phosphate (ATP), phosphocreatine (PCr) and glycogenic substrates, and the intracellular accumulation of metabolites (adenosine di-phosphate (ADP), inorganic phosphate (Pi), hydrogen ions (H+) and magnesium (Mg+), each of which has been implicated as a cause of muscle fatigue [1-3]. Excessive formation of H+ results in a decrease in intramuscular pH which may contribute to fatigue in some models of exercise [1,4-6]. Enhancing an individual's ability to buffer protons may delay fatigue by improving the use of energy substrates and maintaining muscular contraction [6-9]. When the time and intensity level of exercise is sufficient, the majority of protons that are produced are buffered by the bicarbonate (HCO3-) buffering system [10,11] in which they are exported from the muscle . Physiological buffering during dynamic exercise is typically controlled by the HCO3- system and is also supported by direct physico-chemical buffering, provided mainly by phosphate, hisitidine residues of peptides and proteins, and the small amount of bicarbonate present in muscle at the start of exercise. However, during short bursts of intense exercise, such as HIIT, physico-chemical buffering will exceed that by HCO3- mediated dynamic buffering, calling on intramuscular stores of phosphates and peptides. Specifically, carnosine (β-alanyl-L-histidine), a cytoplasmic dipeptide, constitutes an important non-bicarbonate physico-chemical buffer. By virtue of a pKa of 6.83 and its high concentration in muscle, carnosine is more effective at sequestering protons than either bicarbonate (pKa 6.37) or inorganic phosphate (pKa 7.2), the other two major physico-chemical buffers over the physiological pH range [7,13]. However, as a result of the greater concentration of carnosine in muscle than bicarbonate in the initial stages of muscle contraction, and inorganic phosphate, its buffering contribution may be quantitatively more important. Mechanisms for increasing muscle carnosine concentration have been somewhat disputed. While carnosine may be increased in chronically trained athletes, the effects of acute training are less clear. In one study, it has been reported that eight weeks of intensive training may increase intramuscular carnosine content . In contrast, several other studies have shown that intense training, of up to 16 weeks, has been unable to promote a rise in skeletal muscle carnosine levels [6,15-17]. Only when β-alanine supplementation was combined with training did an increase in muscle carnosine occur , although the increase (40–60%) was similar to that seen with supplementation alone . While carnosine is synthesized in the muscle from its two constituents, β-alanine and histidine , synthesis is limited by the availability of β-alanine [18,20]. β-alanine supplementation alone has been shown to significantly increase the intramuscular carnosine content [6,18]. Elevation of intramuscular carnosine content via β-alanine supplementation alone, has been shown to improve performance [6,14,21-24]. Recently, Hill and colleagues  demonstrated a 13% improvement in total work done (TWD) following four weeks of β-alanine supplementation, and an additional 3.2% increase after 10 weeks. Zoeller et al. also reported significant increases in ventilatory threshold (VT) in a sample of untrained men after supplementing with β-alanine (3.2 g·d-1) for 28 days. In agreement, Kim et al. also reported significant increases in VT and time to exhaustion (TTE) in highly trained male cyclists after 12 weeks of β-alanine (4.8 g·d-1) supplementation and endurance training. Furthermore, Stout et al. [22,23] reported a significant delay in neuromuscular fatigue, measured by physical working capacity at the fatigue threshold (PWCFT), in both men and women after 28 days of β-alanine supplementation (3.2 g·d-1 – 6.4 g·d-1). Despite the improvements in VT, TTE, TWD, and PWCFT after supplementation, there were no increases in aerobic power, measured by VO2peak [22-24]. So why test BA with HIIT? Although HIIT alone does not appear to increase skeletal muscle carnosine content , training has been suggested to improve muscle buffering capacity [25-27]. When repeated bouts of high-intensity intervals are interspersed with short rest periods, subsequent trials are initiated at a much lower pH . Training in such a manner subjects the body to an acidic environment, forcing several physiological adaptations. Notably, HIIT has been shown to improve VO2peak and whole body fat oxidation in only two weeks (7 sessions at 90% VO2peak) . Furthermore, over a longer period of time (4–6 weeks), HIIT has been reported to increase high-intensity exercise performance (6–21%), muscle buffering capacity, whole body exercise fat oxidation, and aerobic power (VO2peak) [25-27]. Our findings support the use of HIIT as an effective training stimulus for improving aerobic performance, in as little as three weeks. The use of β-alanine supplementation, in combination with HIIT, appeared to result in greater changes in VO2peak and VO2TTE, during the second three weeks of training, while no significant change occurred in placebo group. In addition, TWD significantly (p < class="entity">β-alanine and Placebo groups, respectively. While more research is needed, the current study suggests that in untrained young men, the use of β-alanine supplementation may enhance the benefits of HIIT and augment endurance performance. From the above, we can begin to see why creatine and beta-alanine are being proposed as the super 1-2 punch (well actually the latest is creatine, beta-alanine and citruline malate) for strength in resistance and endurance training. It's a hypothesis but the bet is that combining both Cr shown to be good for certain parts of HIIT and BA shown to be good for quite a few, might just be double plus good? So for those of us doing power/endurance strength work like the Long Cycle, or Viking Warrior Conditioning, Cr+BA seems well worth exploring. That said, a key point may be to remember that while Cr. can kick in in 7 days and have an effect, it takes BA about 3+ weeks. If you're thinking of giving either of these supplements a go, brand doesn't matter. Just look for certified GMP (cGMP) - see this overview on supplements for why. On Creatine, also, their are a bunch of types. Creatine Monohydrate is the one that gets studied and is the best. Creapure is a particular Creatine Monohydrate that's micronized for easy mixing that is 99% pure - look for a brand that's re-packaged that and you're doing great. Supplement Quality: is what's on the label really in the Tin? Nutrient timing MAY make a difference. Carbs or Protein before bed? what's a scientific abstract and how's it used?